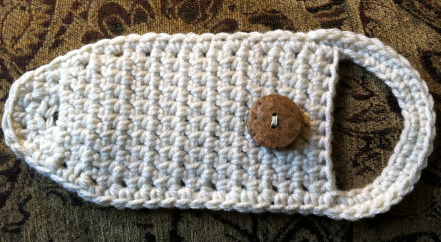 Instead of crecheting onto a towel, why not try crochet a towel holder? Now you can change out the towel when needed! Row 7-20: Repeat row 6. Ch 18, sl st into last st opposite the end you chained from. Ch 1, turn. Sc back into each of the 18 chains you just made. Turn your work on its side. 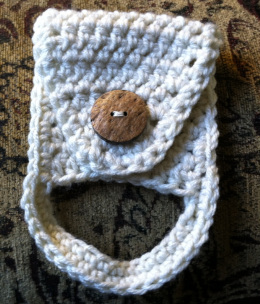 You are going to put a sc in each stitch around the perimeter of the piece., including each stitch of the ch 18. Put 2 sc in each corner. Once you have sc in each st all the way around your work, place a sl st in the very first sc you made. Fold the narrow end of your piece over your oven bar (or where ever you plan on using it) to determine where you need to place your button. Sew button firmly into place with needle & thread. Enjoy!